We are proud to announce that OpenSesame now offers more than 5,000 courses that work on iPad, iPhone and other iOS devices. Workers in today’s knowledge economy need access to training content that works on their favorite mobile tools – especially on best-selling iPads. To meet this increasing demand, OpenSesame has developed technology that enables users to access a large selection of courses on iPhones, iPads and other iOS devices. You can start browse courses on the OpenSesame website from your iPad or other iOS devices right now. When searching or browsing for courses, just check the box for “Mobile iPhone/iPad” and you’ll only see results that play successfully on iOs mobile devices. Once you’ve made a purchase, you can get started learning instantly on your mobile device. When you make a purchase from OpenSesame, you can use your courses instantly on the OpenSesame website, through email with CourseCloud™ or in any learning management system (LMS) that supports mobile access. Currently, our iOS catalog includes 5,000+ courses in business skills, compliance and technology topics. Many courses include videos and others use interactions and simulations to reinforce learning activities. 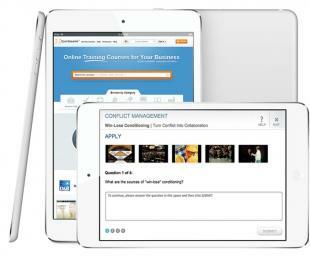 Many OpenSesame sellers are working on creating courses in iOS compatible formats and we expect to see growing numbers of iOS-compatible courses throughout 2013.